The challenge was to continue updating the recipe we have worked on for many recent challenges by adding form validation. The first step is to add the HTML markup for HTML5 form validation features. 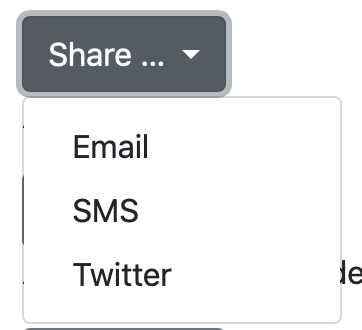 In this case that meant ensuring the email address fields were <input> tags with type="email", and adding the required attribute to all required fields. To facilitate Bootstrap validation I updated both forms to give them an ID, changed the buttons to have type="submit", and changed the click handlers on those buttons to submit handlers on their relevant forms. With the HTML5 markup in place on both forms I moved on to adding bootstrap validation to each form in turn. For the login form I decided to use full custom Bootstrap validation with popover notifications in order to earn the offered extra credit. The documentation for validation tooltips can be found here. The fist step in accomplishing this is disabling the standard HTML5 form validation messages by adding the novalidate attribute to the relevant <form> tag. Next, I added a <div> that will serve as a tooltip with a validation message when ever the form is validated and found to be invalid invalid tooltip into the input group. This <div> needs to be added inside the input group but not as the first or last element. I added it after the inputs but before the input-group-append. The documentation clearly states that the tooltip must be contained within an HTML element with CSS position property relative. I achieved this by adding an inline style to the input group itself to set its position to relative. The first thing to remember is that the result of a comparison operator is a boolean, so allOK will have a value of true or false depending on whether or not the statement to the left of the === evaluates to exactly 2. So, what about the thing to the left of the ===? It is a call to the jQuery $() function with two arguments, a CSS selector, and a jQuery object. When passed these two arguments jQuery searches for all elements matching the CSS selector contained within the elements represented by the jQuery object. In this case we are looking for all <input> tags with the pseudo-class :valid contained within the login form. Since there are only two <input> tags within this form, the $() function will return a jQuery object representing zero, one, or two valid inputs. Remember that a jQuery object’s .length property reveals the number of elements the object represents. So, since there are two inputs in total, then of there are two valid inputs, the form is valid. Again, this is a call to jQuery’s $() function with two arguments, a CSS selector and a jQuery object, but in this case, the selector uses the CSS Attribute selector which we’ve not seen in quite some time. Within a CSS selector square brackets are used to match on an HTML attribute, so, the CSS selector button[type=submit] queries for <button> tags with their type attribute set to submit. So, the call to the $() function will return a jQuery object representing the submit button within the login form. We then use jQuery’s .prop() function to set the value of the button’s disabled property. With the validation function declared the code then goes on to add a new submit handler for the login form. Since we have taken full control of validation, we need to either do what ever we want to do on submission, or, detect validation errors and prevent submission. The submit handler uses the validation function to determine whether or not to proceed, and then either pops up a message to tell the user their form would have been submitted if it were real, or, it blocks the submit. Finally, I added an event handler to all inputs within the login form to validate the form each time data is input. At first glance this looks OK, but there actually is a problem. Bootstrap validation tooltips appear directly below form inputs, and since this form is at the very bottom of the page within the footer, it’s adding extra scrolling and a white bar below the subtle grey footer. We really want the tooltip above the inputs. Unfortunately, while control of the positioning has been requested as an open issue on Bootstrap’s GitHub page, it hasn’t been implemented yet. We can fix it ourselves though with a little CSS. Using the developer tools I was able to determine that the tooltip is positioned absolute with top set to 31px. This means we can alter the position of the tooltip by setting a different value for the tooltip’s top CSS property. 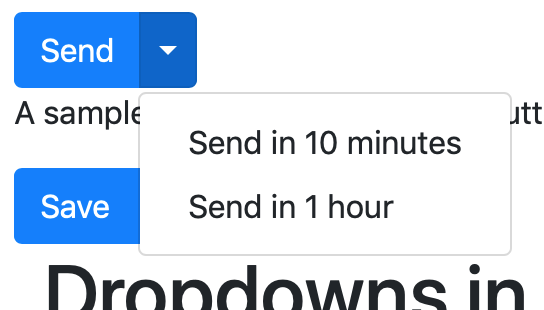 With a little experimentation I found that -2.5em worked well, so I added the following inline CSS attribute to the tooltip’s <div> tag: style="top: -2.5em". With that subtle change made things look much better! Let’s nip something in the bud straight away — a Bootstrap Dropdown is not an HTML <select> tag. It’s not trying to replace the <select> tag, and without some serious bodging, you can’t use it as one. The reason this is confusing is that we often refer to <select>s as dropdowns. So if a Bootstrap Dropdown is not a form dropdown, what it is? It’s a dropdown menu. I’ve taught myself to imagine a silent Menu after Bootstrap Dropdown. Bootstrap dropdowns are useful in two distinct contexts, and they come in two distinct variants — one based around <a> tags, and one based around <button> tags. The first variant is intended to be used in navigation menus, and the second in web app UIs. In this instalment we’ll focus on the web app UI variant, i.e. Bootstrap Dropdowns built with <button> tags. We’ll look at Bootstrap Navigation bars in general and navigation bars with Dropdowns in the next instalment. 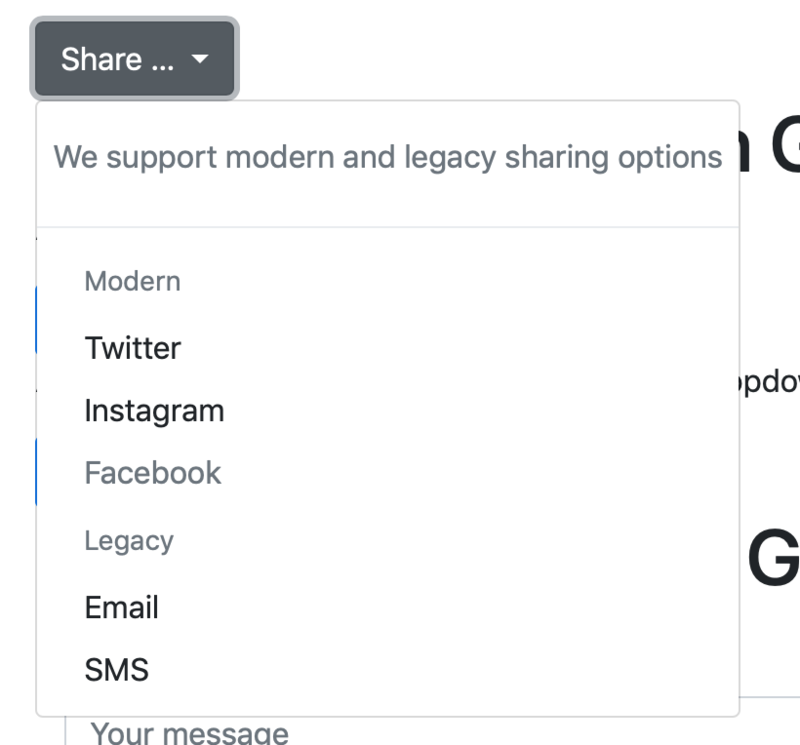 Before we narrow our focus to button-based Bootstrap Dropdowns, let’s look at the big-picture design, because that remains consistent between variants. Dropdowns consist of two related parts; a toggle, and a menu containing menu items. The entire dropdown (toggle and menu) must be contained within another Bootstrap component that supports dropdowns, and as we’ll see, quite a few of them do! For accessibility reasons, the element being used as the toggle should define the ARIA attributes aria-haspopup="true" and aria-expanded="false". The simplest form of a dropdown is the stand-alone form. In this case, the container is simply a tag (usually a <div>) with the class .dropdown. Note that all the examples below can be found in the file pbs67a.html in this instalment’s ZIP file. To create a basic button-based Bootstrap Dropdown start with a container tag of your choosing, usually a <div>, and give it the class .dropdown. Opt the <button> into the opinionated Bootstrap types for buttons in the usual way, i.e. give it the class .btn and one of the standard Bootstrap styles like .btn-secondary. Give the <button> the class .dropdown-toggle. Make sure the button is not set to be a submit button by being sure it has type="button". Give the <button> the data attribute data-toggle="dropdown"
Give the <button> the ARIA attributes aria-haspopup="true" aria-expanded="false". Give the button an ID so we can use it as the ARIA label for the menu. With the trigger added, the next thing we need is the menu. This will consist of a container tag, again, usually a <div> with the class .dropdown-menu. To make the menu accessible it should use the aria-labelledby attribute to connect it to the trigger. Within this new container we then add the buttons that will make up the menu’s contents. Each of these buttons should have the class .dropdown-item and type="button". By default the Dropdown will prefer to drop downwards, but if it’s at the bottom of the page it will ‘drop’ upwards. If you want to force a particular direction you can do so by replacing the .dropdown class on the container with one of .dropup, .dropright, or .dropleft. When you look at menus in the apps you use you’ll see they contain more than just menu items, they also contain additional un-clickable items that add context like dividers, section headings, and help text. To add a divider in a menu simply add an empty tag of your choice (usually a <div>) as a sibling to the buttons with with the class .dropdown-divider. To add a heading add a tag of your choice (again, usually a <div>) which contains the heading text and has the class .dropdown-header. Finally, to add some help text add a tag of your choice (usually a <p>) containing the text. You don’t need to add any classes, but you can use the usual utility classes if you want to add some padding or things like that. Note that if you set a button in a dropdown menu to be disabled, Bootstrap will style it appropriately (see the Facebook option in the menu above). Normally, the only thing visible on a collapsed dropdown is the trigger, and the only thing that happens when you click the trigger is that the menu expands. 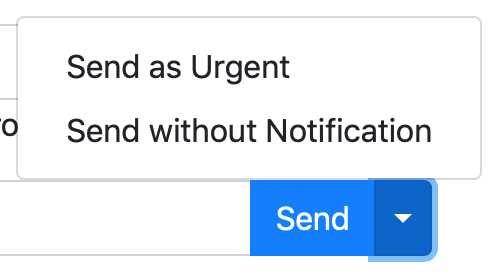 You’ll often see a subtly different design in UIs, the so-called split button where the main body of the toggle is a separate button that performs a default action, and next to it is a triangle icon which expands the dropdown which shows related actions. With Bootstrap you can achieve this using a button group as the container for the default button, the trigger button, and the dropdown menu. The button group does not get the class .dropdown, but if you want to drop in a different direction you do need give the button group the class .dropup, .dropleft, or .dropright. When creating a split button the button to toggle the dropdown should not contain any visible text, it should be left apparently empty and Bootstrap will insert and triangle icon. However, to support screen readers we should add some text wrapped inside a <span> with the class .sr-only stating that button expands the dropdown. To allow Bootstrap to lay out the icon correctly, we also need to give the toggle button the classes .dropdown-toggle and .dropdown-toggle-split. You can’t add a dropdown just anywhere in an input group, but you can add a regular dropdown or a split button as either an input group’s append or prepend element. You do this by using the .input-group-prepend or .input-group-append in the same way we used a button group in the previous section. Continuing on with our recipe, update the login form so it uses a split button to offer three login options; a default simply labeled “Admin Login”, and two additional options in the dropdown labeled “Login for 5 minutes” and “Login for 1 hour”. We’ve now seen how we can add dropdown menus to our web app UIs. We’ve not actually covered everything you use a Bootstrap Dropdown menu for in this context — you can actually add form elements inside dropdowns, but I’ll leave that advanced topic as some optional additional reading for those interested. You’ll find the relevant documentation here. In the next instalment we’ll look at navigation menus in Bootstrap in general, and then at adding dropdowns into navigation menus.